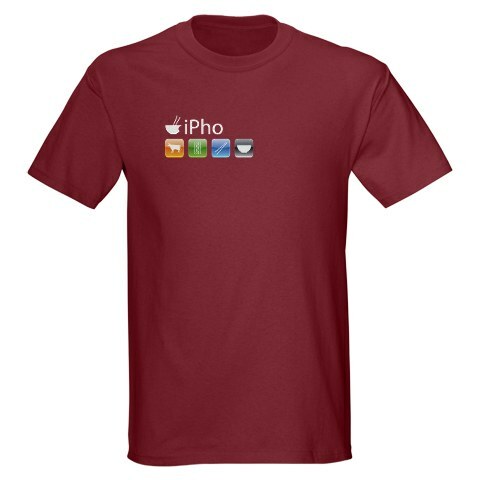 John Le Hung is just back from a visit to Vietnam, with news of iPho t-shirts available there. Knowing my enthusiasm for pho, he considered getting me one, but was put off by their being offered only in brilliant Communist red and in any case wasn’t sure about my attitude towards quirky t-shirts. No problem, I told him, I’m into t-shirts (see Whiskey Tango Foxtrot, here), and I’m sure these will be available on-line. Some silliness for a Sunday morning. This entry was posted on April 24, 2011 at 8:14 am and is filed under Clothing, Language play, Silliness. You can follow any responses to this entry through the RSS 2.0 feed. You can leave a response, or trackback from your own site.